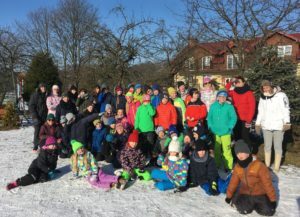 English Immersion American Winter Camp is held in February in Hotel Marylii in Ostrzyce, Poland. This is a 6-day camp where we have a relaxed atmosphere and run amazing indoor and outdoor activities. The cold does not stop us from having fun. At winter camp, it actually enhances it! When the weather is cold and snowy, we use it to our advantage by going sledding every day and playing all sorts of games in the snow. If you like getting rough and crazy, we even have fantastic snowy American football games. We also have a sleigh ride around the beautiful Kaszubian area, something that everyone loves. We also have movie nights and end our camp with a crazy disco and karaoke party!